Reference boards using NVidia's GeForce 6600 GT (top), and ATI's Radeon X700 XT. To get the most bang from ultrarealistic-looking games such as Doom 3, Far Cry, and Half-Life 2 on a PCI Express-based PC, you want top-notch graphics hardware like ATI's Radeon X800 XT Platinum Edition or NVidia's GeForce 6800 Ultra. But if you don't have $500 to drop on a graphics board, check out products that use one of the companies' new midrange graphics chips. They promise impressive performance for less than half the price of top-end boards. We tested reference boards using ATI's new Radeon X700 XT chip and NVidia's GeForce 6600 GT chip. Each reference board had 128MB of memory, and for each we used the latest drivers (beta versions, in each case). 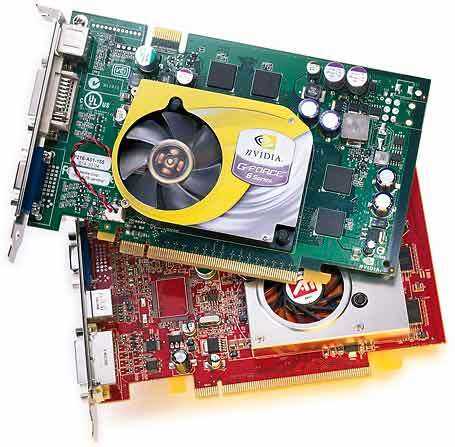 Our test PCI Express-based boards performed well in the Intel Pentium 4 560 test system we used; but in almost all of our early tests, NVidia's GeForce 6600 GT held the lead over ATI's Radeon X700 XT. In games such as Doom 3 and Far Cry, the NVidia chip's lead was pronounced. When running Far Cry at 1600 by 1200 resolution, the 6600 GT posted 36 frames per second without antialiasing and 18 fps with it, while the X700 XT managed to crank out 23 fps and 10 fps, respectively. When running Doom 3 at 1024 by 768 resolution without antialiasing, the 6600 GT managed an impressive 55 fps while the X700 XT clocked a more modest 40 fps. When we turned antialiasing on at the same resolution, the gap narrowed, with the 6600 GT dropping to 33 fps and the X700 XT slowing to 25 fps. Both Doom 3 and Far Cry make extensive use of pixel and vertex shaders--bits of code that allow game developers to take full advantage of powerful graphics processors to create amazing custom effects. Hence those two games should provide a good indicator of how well these chips will handle future games. The two chips turned in much closer marks when running slightly older games. For example, the 6600 GT managed 76 fps versus the X700 XT's 66 fps in our Halo test, at 1024 by 768 resolution. And in our Splinter Cell test, at 1600 by 1200 resolution and using the game's medium setting, the ATI board won, with 64 fps to the NVidia's 57 fps. Retail boards are expected to sell for about $200, so this generation of mainstream graphics chips should turn out to be a good value. Though NVidia clearly had the early lead in our preliminary tests, we expect retail boards based on both companies' chips, with fully baked drivers, to perform even better. Unfortunately, because both ATI and NVidia elected to build their mainstream chips for PCI Express-based systems first, owners of AGP systems are left waiting. NVidia says that GeForce 6600 AGP boards should be ready around the time you read this. ATI, for its part, has yet to announce any plans to offer the X700 series of chips for AGP-based boards. In the meantime, if you're the lucky owner of a PCI Express PC and you're ready for a graphics upgrade, you'll be hard-pressed to find a better deal than a $200 board based on NVidia's GeForce 6600 GT.